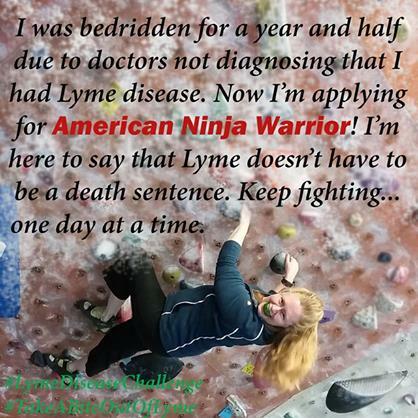 »Uncategorized»Blog Post Link ~ Liberation Through Lyme ~ Why American Ninja Warrior? I wanted to do this for so many reasons. My original reason was because everyone told me I couldn’t. I wanted to show them all that I may have stumbled temporarily but that I was not staying down. I also wanted to bring attention to the plight of the Chronic Lyme sufferer. Honestly,I originally treated it as a bit of a publicity stunt. But through this journey my motivation shifted- when I announced that I had actually submitted my application, I was flooded with messages of people telling me how I inspired them to keep going in their personal struggles. They said that seeing me fighting back helped them do the same- no matter what, even if it’s baby steps day to day, moment to moment.